This frame grab from the Saudi-owned television network MBC (Middle East Broadcasting Center) shows Suleiman Abu Ghaith in an undated videotape broadcast by the Dubai-based MBC in April 2002. Osama bin Laden's son-in-law was sentenced Tuesday to life in prison for acting as al-Qaida's spokesman after the Sept. 11 terror attacks. Sulaiman Abu Ghaith was sentenced by U.S. District Judge Lewis A. Kaplan, who said he saw "no remorse whatsoever" from the 48-year-old imam. "You continue to threaten," the judge said. "You sir, in my assessment, still want to do everything you can to carry out al-Qaida's agenda of killing Americans." Abu Ghaith was the highest-ranking al-Qaida figure to face trial on U.S. soil since the attacks. 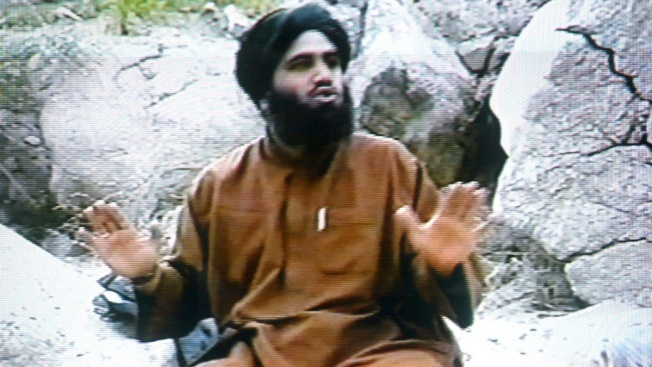 The Kuwaiti cleric became the voice of al-Qaida recruitment videotapes after the 2001 attacks. He testified at trial that his role was strictly religious. Defense attorney Stanley Cohen asked the judge to impose a 15-year sentence. A prosecutor called for life in prison. Abu Ghaith was convicted in March on conspiracy charges that he answered Osama bin Laden's request in the hours after the attacks to speak on the widely circulated videos used to recruit new followers willing to go on suicide missions like the 19 who hijacked four commercial jets on Sept. 11. "The storm of airplanes will not stop," the Kuwaiti imam warned in an October 2001 video that was played for the jury. Jurors also saw frames of a video made Sept. 12, 2001, in which Abu Ghaith was seated next to bin Laden and two other top al-Qaida leaders as they tried to justify the attacks. Taking the witness stand in his own defense, Abu Ghaith calmly denied he was an al-Qaida recruiter and claimed his role was a religious one aimed at encouraging all Muslims to rise up against their oppressors. He insisted he agreed to meet with bin Laden in a cave on the night of Sept. 11, 2001, out of respect for bin Laden's standing as a sheik. In asking for leniency, Cohen compared his client to an outrageous shock-radio host. The attorney wrote in court papers that Abu Gaith "faces the harshest of penalties for talk — and only talk — which is at times zealous, pious and devout; at other times intemperate; at still others, offensive to core values of humanity." In a submission seeking a life sentence, the government responded by calling the comparison to a radio host "as absurd as it is offensive" and accused the defense of trying to minimize Abu Ghaith's role in promoting al-Qaida's deadly agenda. "Abu Ghaith was a terrorist who sat alongside bin Laden on the morning of Sept. 12, 2001, celebrating the murder of nearly 3,000 innocent, men, women and children the day before," prosecutors wrote.